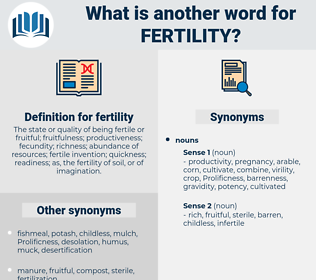 What is another word for fertility? 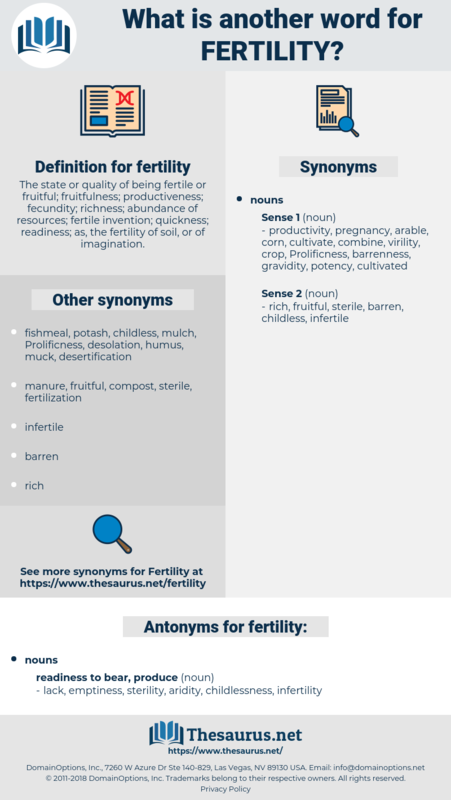 The state or quality of being fertile or fruitful; fruitfulness; productiveness; fecundity; richness; abundance of resources; fertile invention; quickness; readiness; as, the fertility of soil, or of imagination. child-bearing, fertilisation, fertilizer, natality, sterilization. lack, emptiness, sterility, aridity, childlessness, infertility. Of course, the latter must be removed, and, as a rule, the crops on new land - which has been undisturbed by the plow for a number of years and, perhaps, never robbed of its original fertility - will amply repay for the extra labor of clearing. Under dry - farm conditions the fertility is good, but the moisture is low.